Do you ever have this amazing experience when a synchronicity is so overwhelming that you find yourself reveling in the inspiration of it all and it moves you to tears? That happened to me this morning. I have this lovely ritual in the summer: I enjoy my coffee on the patio, have my morning meditation (what my mother used to call, “Staring into my coffee cup,”), read some of the Bible, some of Sarah Ban Breathnach’s Simple Abundanceand sometimes a few other treasures like Speaking Your Truth an anthology, and A Guide for the Advanced Soul: A Book of Insight by Susan Hayward. I am preparing to give a talk about faith and finances. It never fails that, after this morning ritual, I am incredibly inspired for my work. I thought about how we all are called to share whatever gifts are bestowed on us; it is our responsibility. Through doing so, we are passing the baton of joy and inspiration and abundance to each other. This serves as an exultant connection to our path, our careers, each other, and whatever definition of the Divine we imagine. The feeling of abundance (since it cannot be measured) is derived from the connection; the sharing. Of course, your definition of abundance may differ from mine and from others’; it’s knowing what your definition of abundance is, so that you know it when you experience it. If you’re always looking for abundance but don’t know what it looks like, you’ll never find it. If you are open to delving a bit deeper into the interconnectedness of life, read Clarissa Harison’s blog post Bee Swarming: A Lesson on Rebirth (actually all of her posts are tremendously inspired, in fact, the name of her blog “Awen” is a Welsh word for “inspiration” or “muse”). 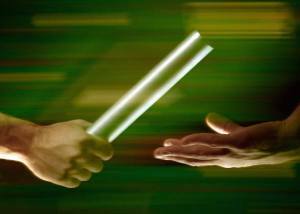 0 responses on "Featured Blog: Sharing Our Gifts, Passing the Baton & the Link to Abundance"